Our history, and meet our team! Founded in 1994, with 4 part-time employees. Over the years we've grown to 180 call center seats! The idea behind TeleMarketing Resource Services was formed in late 1993. Owner, Julie Hutchings had been working as an independent consultant for many local Modesto, CA companies, providing assistance and training of their in-house telemarketing staff. In talking with the owners and managers of these organizations, it was soon realized that both time and money could be saved if the telemarketing was outsourced. In April 1994, Julie opened a new call center – TeleMarketing Resource Services. With the support of some of the leading companies in the financial and insurance industries, TeleMarketing Resource Services quickly became one of the leading telemarketing firms in the United States. In 2000, a decision was made to change the name of the company from TeleMarketing Resource Services to TeleContact Resource Services in order to better encompass the more advanced services that the company now offered. 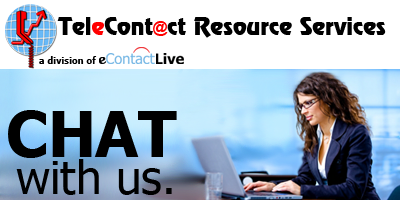 The company then incorporated in 2008 as eContactLive, Inc., and filed a DBA as TeleContact Resource Services. In 2000, a decision was made to change the name of the company from TeleMarketing Resource Services to TeleContact Resource Services in order to better encompass the more advanced services that the company now offered. The company then incorporated in 2008 as eContactLive, Inc., and filed a DBA as TeleContact Resource Services which they continue to utilize. Since 1994, eContactLive, Inc. has evolved into a multi-channel marketing firm, not only providing outbound telemarketing services, but also expanding into data procurement and list management, as well as a full suite of online marketing services. With expansion into these different channels, they have been recognized as one of the top 5,000 fastest growing privately held companies in the United States by Inc. Magazine in 2010, 2011, and 2012. Our Accounts Managers are experts at helping you define your target markets, acquire pre-qualified prospect lists, script development, and overal campaign management. Most everyone on our administrative team started as a call center agent and worked their way up. You won't find this much experience in the telemarketing business anywhere! We're not your ordinary telemarketing firm! Our call center management and agents are the best in business, and we maintain a family atmosphere at our beautiful facility.